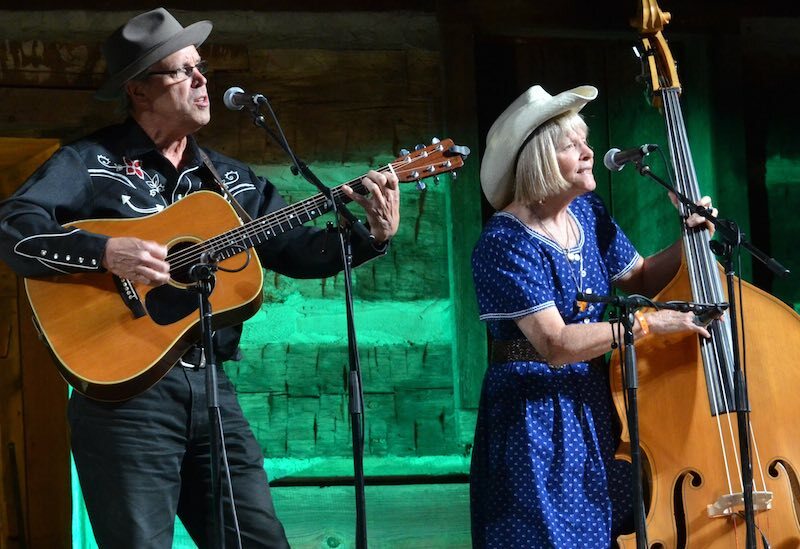 Hunter and Suzy Owens have taken out first place in the Chris Austin Songwriting contest at this year’s MerleFest. They have returned to Australia elated and share the story with us. Participating in the Chris Austin Songwriting Contest at MerleFest 2015 is an experience I shall never forget. The organisation was excellent and they took very good care of us with comfortable accommodation, VIP Festival passes and helping to organise an instrument for Suzy. Jim Lauderdale, convener and mentor for the contest, was a humble host, encouraging to every single participant. He acknowledged everyone both going on and off the contest stage, helping to boost confidence levels and certainly succeeding with us. As winners of our country category, we got to perform with the four other winners on the Cabin Stage, which is the “‘tweener” stage beside the Main Stage. It was just on dark when we took to the stage and the sound system was mighty big; what a vocal sound. Yes, I admit that I could easily get used to that situation. The lineup at this year’s MerleFest was typically diverse. Highlights for me were the Kruger Brothers with the Kronos Quartet, Nashville Bluegrass Band, Sam Bush Band, Bruce Robison and Kelly Willis, Mipso, Steel Wheels, Jim Lauderdale, Robert Earl Keen, Peter Rowan and Dwight Yoakum. In conclusion, I would love to return to and possibly perform at this festival again and I recommend it to anyone who, like Doc Watson, has an open mind and a love for “traditional plus” music. Got back on Friday 1st of May after a 17 hr flight from Dallas Tx. We are still flying high. What an incredible experience, it is one I will treasure all my life. Going to MerleFest, winning the Country section and playing on the Cabin Stage in front of thousands, it is hard to believe and put it all into words, it was all just amazing, what a thrill!!! We took to the stage on a perfect night weather-wise, just as it became dark, lights twinkling, the crowd stretching as far as the eye could see. The Marshall Tucker Band had just completed their set and we were to be followed by the Sam Bush Band. As we stood inside the cabin waiting our turn to step on stage I imagined this is how it might feel to be about to parachute out of a plane, knowing you are next and there is no backing out now. Once on stage all nerves were gone, I snapped a quick photo of the crowd with my camera and we did our thing. The on-stage sound was brilliant, the vocals everything you could wish for. Our images were projected up on three giant screens and our music piped clear across the festival grounds, as well as on the radio and in the shuttle buses. It was truly awesome. What does a cowgirl do when she is travelling across the pond but needs an upright bass? Well I got lucky: I had the great fortune of playing an absolutely beautiful Kay bass belonging to David Morris, one of the songwriters who won the bluegrass section. His generosity of spirit was instrumental in getting us over the line and something I will never forget. We share a special bond and are friends forever. Judges for the songwriting competition were Bruce Robison, Jesse Bellamy and Peter Rowan.